(VEN) - Recently TRAFFIC and Intelligentmedia, launched the second phase of their Chí (Strength of Will) initiative, with updated messages and images to continue with the mission to instill a zero-tolerance towards rhino horn consumption. “The Chí message has already reached over 5 million Vietnamese people and has actively engaged 2 million businessmen attending conferences, workshops and other events in Viet Nam,” says Mrs MadelonWillemsen, Head of TRAFFIC’s Viet Nam Office. “The private and public sectors are showing leadership in the fight against wildlife crime with Chí as the driving force that will instill a zero-tolerance towards illegal consumption of wildlife.” added Willemsen. The initiative is based on the Vietnamese concept of Chí to target the group identified as the primary users of rhino horn: wealthy urban men between the ages of 35 and 55. The overarching message of Chí drives the concept that success, masculinity and good fortune come from an inpidual’s strength of character and not externally from a piece of horn.It encourages wealthy businessmen to demonstrate their Chí by becoming leaders in corporate social responsibility and in wildlife protection. It also calls on inpidual businessmen to act as leaders in their community and take a stand against the consumption of rhino horn in their personal lives and business networks. Demand for rhino horn in Asia is driving the poaching of rhinos in Africa and Asia, with over a 1,000 animals illegally killed each year for their horns, putting the future survival of rhinos in jeopardy. Rhino horn is mainly used by wealthy inpiduals as a supposed health tonic and as a means to flaunt their wealth: the buying and selling of rhino horn is illegal under international and national legislation in Viet Nam. 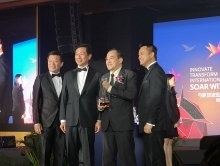 In the latest phase, Mr Tran Bao Son joins Khai Silk and other successful business leaders inproclaiming that men should harness their inner strength and character and refute the notion that these traits come from external factors, such as rhino horn. 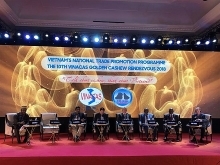 The Central Committee of Propaganda and Education (CCPE), prominent civil society organizations, like the Vietnam Chamber of Commerce and Industry (VCCI), Viet Nam E-commerce Association (VECOM) and the State-owned Vietnam Posts and Telecommunications Group (VNPT) have been key partners and taken a leadership role in integrating the Chí initiative into business and society. The first phase of Chí was launched on World Rhino Day, September 22nd, in 2014 by TRAFFIC and Save the Rhino International and funded by the UK government./.